FF2 Media Editor-in-Chief Jan Lisa Huttner explores the implicit misogyny of religious fundamentalism in a compare/contrast of two recent Israeli films. It can't just be that I was no fan of Rama Burshtein's first film Fill the Void. I had heard raves about her second film -- The Wedding Plan -- from people I love and respect, so I went to my Tribecca Film Festival screening on April 26th expecting the best... but I left the theatre in dismay. To say I didn't like The Wedding Plan would be an understatement. I had crossed a familiar divide and I was ready to rant, as angry about The Wedding Plan as I had been about Ida and Son of Saul (two Oscar-winning films which I also loathed even as all my colleagues -- not to mention most of my Jewish friends -- raved). In all three cases, I had felt violated as a woman and as a Jew... or maybe best to say as who I am, namely a proud Jewish Feminist. But there was something else impacting me this time: By the time I saw The Wedding Plan in April, I had already seen The Women's Balcony. In fact, I had already seen it twice, first at the New York Jewish Film Festival in January and then at the New York Sephardic Jewish Film Festival in March. "Why compare?" you might ask. The Wedding Plan is The Wedding Plan, and The Women's Balcony is The Women's Balcony. They are two different films, so why not just like them both -- or not -- as you chose? Why pit one against the other? CAUTION: SPOILER ALERT! PLEASE DO NOT READ ON UNTIL YOU HAVE SEEN BOTH FILMS! OK, so here we go... What The Wedding Plan and The Women's Balcony share thematically is that both films tell stories about contemporary Israeli women living in a country that is growing increasingly theocratic. From my POV, The Women's Balcony is blessed with great empathy for a large cast of fully individuated characters. The narrative is honest and the resolution is realistic. On the other hand, The Wedding Plan has a powerful central character who is surrounded by stick figures. The narrative is ludicrous and the resolution is a lie. Just like here in the USA, there is a liberal faction in Israel that feels compelled to respect religious conviction, and just like here in the USA, they are being played. There is no genuine religious conviction on display in The Wedding Plan. Quite the contrary, the driver of The Wedding Plan is an ambitious American-born filmmaker who is using the trappings of Orthodoxy to snooker audiences and film critics alike, promising them an authentic peek into an otherwise hidden world, but then delivering nothing deeper than a thoroughly contrived and totally routine RomCom search for sexual chemistry. It is by the book, by which I mean not the Book of our forefathers (aka The Good Book which we invoke when we, as Jews, describe ourselves as the People of the Book), but the book of Hollywood. The Women's Balcony, on the other hand, is not just authentic but heartfelt and honest. 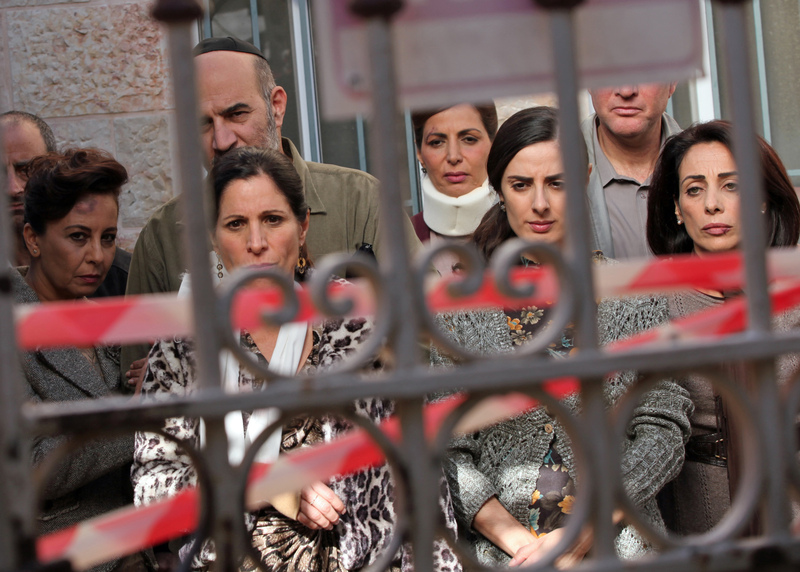 The Women's Balcony is a dramedy that also ends with a wedding, but the tzuris along the way is filled with anguish -- a truly Jewish display of "laughter through tears." There are no stick figures in The Women's Balcony. Even the villain is someone who is acting out of genuine religious conviction (even though his charismatic power over the members of his community leads him to step over clear ethical boundaries). Most important to me is that The Women's Balcony is a modern dross on the deep philosophical conundrum of Theodicy -- Why do bad things happen to good people? If there is a God, how can that God allow the innocent to suffer? And for Jewish people of the 20th and 21st centuries in particular, how could God stand by while six million "Chosen People" perished in the Holocaust? To think that members of the Israel Film Academy watched both of these films and then gave The Wedding Plan multiple Ophir Awards (including the Best Screenplay award) while sending The Women's Balcony team home empty-handed simply breaks my heart. Why go bad things happen to great films? I shake my fist at God and demand an answer! Click here to read my review of The Wedding Plan for JUF Online. Click here to read my review of The Women's Balcony for JUF Online. 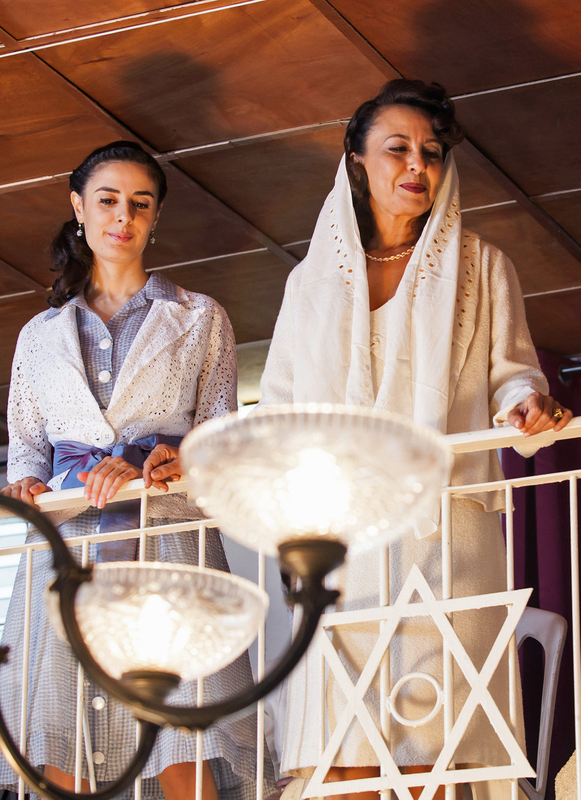 Featured Image (from left): Orna Banai (as "Tikva") and Evelin Hagoel (as "Etti") in The Women's Balcony. 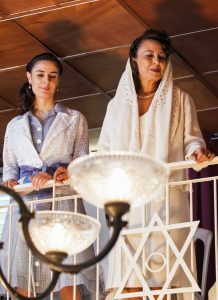 Top photo (from left): Yafit Asulin (as "Yaffa") with Evelin Hagoel (as "Etti") in The Women's Balcony. Bottom Photo: After the accident, Congregants who arrive at the synagogue find all access denied in The Women's Balcony. Photo Credits for The Woman's Balcony courtesy of Menamsha Films.